The history of ‘new literacies’. Those who espoused this doctrine were careful to stress the importance of both being able to both decode and encode, creating and communicating via images. Considine (1986) championed visual literacy as being ‘the ability to comprehend and create images in a variety of media in order to communicate effectively,’ leading to those who are ‘visually literate’ being ‘able to produce and interpret visual messages’ (quoted in Tyner, 1998:105). More recently, with the explosion of what I shall term ‘micro-literacies,’ the concept of ‘visual literacy’ has been re-conceived of as ‘media grammar literacy’ (Frechette, quoted in Buckingham & Willett, 2006:168-9). That is to say it stresses the medium as being at least as important as the message. Hijacking the term ‘literacy’ for such ends has, however, worried some who believe that it conflates ‘literacy’ with ‘competence’ (Adams & Hamm, in Potter, 2004:29). Whilst some in the early 1980s believed that ‘visual literacy’ may ‘still have some life left in it’ (Sless, in Avgerinou & Ericson, 1997:282), others considered the concept ‘phonologically, syntactically, and semantically untenable’ (Cassidy & Knowlton, in Avgerinou & Ericson, 1997:282), as ‘not a coherent area of study but, at best, an ingenious orchestration of ideas’ (Suhor & Little, in Avgerinou & Ericson, 1997:282). Each writer on the term has written from his or her viewpoint, leading to a situation akin to the apocryphal story of the six blind men tasked with describing an elephant, each doing so differently when given a different part to feel (Burbank & Pett, quoted in Avgerinou & Ericson, 1997:283). The feeling from the literature seems to be that whilst there may be something important captured in part by the term ‘visual literacy’, it all too easily collapses into solipsism and therefore loses descriptive and explanatory power. The concept of ‘visual literacy’ continued until the late 1990s, eventually being enveloped by ‘umbrella terms’ combining two or more ‘literacies.’ Parallel to visual literacy from the 1970s onwards came the development of the term ‘technological literacy.’ It began to gain currency as a growing awareness took hold of the potential dangers to the environment of technological development as well as economic fears in the western world about the competition posted by technologically more adept nations (Martin, 2008:158). ‘Technological literacy’ (or ‘technology literacy’) was a marriage of skills-based concerns with a more ‘academic’ approach, leading to a US government-funded publication entitled Technology for All Americans. This defined ‘technological literacy’ as combining ‘the ability to use… the key systems of the time,’ ‘insuring that all technological activities are efficient and appropriate,’ and ‘synthesiz[ing]… information into new insights.’ (quoted in Martin, 2008:158) This literacy was one defined and prompted by economic necessities and political concerns. Although stimulated by competition with non-western countries, a growing awareness in the 1980s that computers and related technologies were producing a ‘postmodern consciousness of multiple perspectives’ with young people ‘culturally positioned by the pervasiveness of computer-based and media technologies’ (Smith, et al., 1988, quoted in Johnson-Eilda, 1998:211-2) reinforced the need for the formalization of some type of literacy relating to the use of computers and other digital devices. Technological literacy seemed to be an answer. Gurak (2001:13) dubbed this a ‘perfomative’ notion of literacy, ‘the ability to do something is what counts.’ Literacy was reduced to being ‘technology literate’ meaning ‘knowing how to use a particular piece of technology.’ The ‘critical’ element of literacy, which Gurak is at pains to stress, including the ability to make meta-level decisions judgements about technology usage, were entirely absent from these 1970s and 80s definitions. Technological or technology literacy is too broad a concept as ‘nearly all modes of communication are technologies – so there is no functional distinction between print-based literacy and digital literacy.’ (Eyman, no date:7) Discussions about, and advocates of, ‘technological literacy’ had mostly petered out by the late 1980s/early 1990s. Growing out of the perceived need for a ‘technological literacy’ came, with the dawn of the personal computer, calls for definitions of a ‘computer literacy.’ Before the Apple II, ‘microcomputers’ were sold in kit form for hobbyists to assemble themselves. With the Apple II in 1977, followed by IBM’s first ‘Personal Computer’ (PC) in 1981, computers became available to the masses. Graphical User Interfaces (GUIs) were developed from the early 1980s onwards, with the first iteration of Apple’s ‘Finder’ coming in 1984 followed by Microsoft’s ‘Windows’ in 1985. There is a symbiotic link between the hardware and software available at any given time and the supposed skills, competencies and ‘literacies’ that accompany their usage. As computers and their interfaces developed so did conceptions of the ‘literacy’ that accompany their usage. We started computer literacy in ’72 […] We coined that phrase. It’s sort of ironic. Nobody knows what computer literacy is. Nobody can define it. And the reason we selected [it] was because nobody could define it, and […] it was a broad enough term that you could get all of these programs together under one roof” (“Interview with Andrew Molnar,” OH 234. Center for the History of Information Processing, Charles Babbage Institute, University of Minnesota, quoted at http://encyclopedia2.thefreedictionary.com/Digital+literacy). In the 1980s applications available from the command line removed the need for users to be able to program the application in the first place. Views on what constituted ‘computer literacy’ changed as a result. The skills and attributes of a user who is said to be ‘computer literate,’ became no more tangible, however, and simply focused on the ability to use computer applications rather than the ability to program (Van Leeuwen, et al., in Cunningham, 2006:1580). On reflection, it is tempting to call the abilities that fell within the sphere of ‘computer literacy’ as competencies – as a collection of skills that can be measured using, for example, the European Computer Driving License (ECDL). By including the word ‘literacy,’ however, those unsure about the ‘brave new world’ of computers could be reassured that the digital frontier is not that different after all from the physical world with which they are familiar (Bigum, in Snyder (ed.) 2002:133). Literacy once again was used to try to convey and shape meaning from a rather nebulous and loosely-defined set of skills. Martin (2003, quoted in Martin 2008:156-7) has identified conceptions of ‘computer literacy’ as passing through three phases. First came the Mastery phase which lasted up until the mid-1980s. In this phase the computer was perceived as ‘arcane and powerful’ and the emphasis was on programming and gaining control over it. This was followed by the Application phase from the mid-1980s up to the late 1990s. The coming of simple graphical interfaces such as Windows 3.1 allowed computers to be used by the masses. Computers began to be used as tools for education, work and leisure. This is the time when many certification schemes based on ‘IT competence’ began – including the ECDL. From the late 1990s onwards came the Reflective phase with the ‘awareness of the need for more critical, evaluative and reflective approaches.’ (Martin 2008:156-7) It is during this latter phase that the explosion of ‘new literacies’ occurred. Literacy is seen as fixed entity under this conception, as a state rather than a process. It became apparent that ‘definitions of computer literacy are often mutually contradictory’ (Talja, 2005 in Johnson, 2008:33), that ‘computer literacy’ might not ‘convey enough intellectual power to be likened to textual literacy,’ (diSessa, 2000:109), and with authors as early as 1993 talking of ‘the largely discredited term ‘computer literacy” (Bigum & Green, 1993:6). Theorists scrambled to define new and different terms. An explosion and proliferation of terms ranging from the obvious (‘digital literacy’) to the awkward (‘electracy’) occurred. At times, this seems to be as much to do with authors making their name known as provide a serious and lasting contribution to the literacy debate. The skills outlined in this definition are more than merely procedural, they are conceptual. This leads to the question as to whether ICT literacy is an absolute term, ‘a measure of a person’s total functional skills in ICT’ or ‘a relative measure’ – there being ICT literacies, with individuals on separate scales (Oliver & Towers, 2000). Those who believe it to be an absolute term have suggested a three-stage process to become ICT literate. First comes the simple use of ICT (spreadsheets, word processing, etc. ), followed by engagement with online communities, sending emails and browsing the internet. Finally comes engagement in elearning ‘using whatever systems are available’ (Cook & Smith, 2004). This definition of literacy is rather ‘tools-based’ and is analagous to specifying papyrus rolls, fountain pens or even sitting in a library on the classical definition. A particular literacy is seen as being reliant upon particular tools rather than involving a meta-level definition. a particularly unfortunate elision’ as it ‘appears to imply inclusion of information literacy, but in fact is only a synonym for IT (or computer) literacy. Its use tends to obscure the fact that information literacy is a well developed concept separate from IT (information technology) literacy. As Town goes on to note, this is not the case in non English-speaking countries. As with Literacy, last week’s post after time spent doing some research, this blog post is a synthesis of some of the issues I have been looking at as part of my studies. I’m aiming to investigate the concept of ‘digital literacy’ and issues surrounding it in my Ed.D. thesis. You can read my proposal at digitalliteracies.edublogs.org. As evidenced in my last post relating to my Ed.D., ‘literacy’ is not a stable concept with a fixed meaning. In fact, since the 1960s, literacy has been deconstructed and re-cast into many different forms. This has followed a change in education, from the imparting of academic knowledge, through to more constructivist theories of learning (Martin, 2003:3) By many, literacy is no longer seen as merely the ability to ‘read and write’, but instead to make sense of the world through wider competencies and abilities. It has been estimated (Grov Almås & Krumsvik, 2007:481) that by the age of 21 the average person will have spent 20,000 hours watching television, 50,000 hours in front of a computer screen, and only 15,000 hours in formal education. Clearly, if literacy is the ability to communicate with, and make sense of, the wider world, it is more than simply the ability to ‘read and write’ texts. Since the 1990s when these writers were working, however, I believe there has been a shift in thinking. Schools have been urged to consider the different ‘learning styles’ of students, suggesting at least various aspects of literacy. In my own academic career I have had to shift from being an undergraduate working primarily from the books of ‘dead white men’ to working almost exclusively in the digital realm. There is no longer a ‘canon’; information and knowledge are everywhere. Literacy in this digital realm needs to include at least some sort of reference to trust and the ability to critically analyse sources of information. The similarities between the stated competencies of information literacy, visual literacy, and media literacy are so close that separating them seems unnecessarily artificial. The need to set one literacy apart from another can only be explained by a need to use the concepts for other reasons, that is, to strengthen the professional status of its constituencies, or to take issue with the approaches used by proponents. 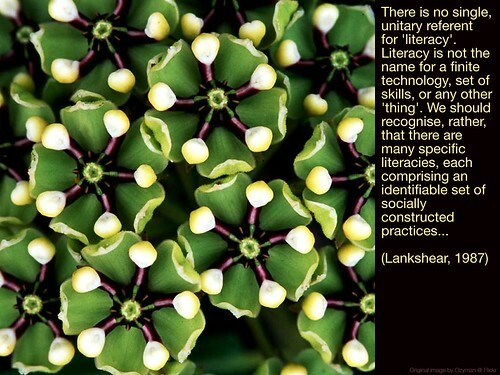 Reading literacy, visual literacy and computer literacy are not synonyms for media literacy; instead, they are merely components. It is as if they are trying to grasp for something in common but falling short of describing it adequately. Johnson (2001:1), Rodríguez Illera (2004:58-59), and Søby (2003) illustrate this desire to move away from literacy to a new concept that involves communication, context and competence. They wish to stress procedure over prose, reforming literacy as a series of literate practices. [Dr. Schaab’s] results are at least compatible with the notion that digital competence (i.e., competence in working within a highly computerized environment) is not equally distributed across personality types; rather, some personality types are simply more digitally competent than others. Such a finding, if replicated, would have profound consequences for human factors theory, research, and practice. A culture’s predominant mode of literacy depends on the technology and mass media it embraces (Sinatra, 1986). In education’s continuing mission of meeting the needs of learners, an apparent shift from the long-standing process of reading, writing, counting, and text memorization skills that may have been appropriate for the medieval clerk, are giving way to skills of analysis and innovation that are considered desirable in today’s modern cultures (West, 1997). Proficiency with words and numbers is insufficient and must be supplemented with additional basic skills as new and emerging technologies permeate activities of daily living. Viewing change with fear and skepticism often accompanies shifts such as these that can revolutionize society. Buddha knows best, or why ‘digital literacy’ is so hard to pin down.